This Kickstarter project will be a book featuring a collection of Political Cartoons focusing on the journey and legacy of the first African American President of the United States of American, Barack Hussein Obama depicted from the perspective of a diverse group of Political cartoonists. 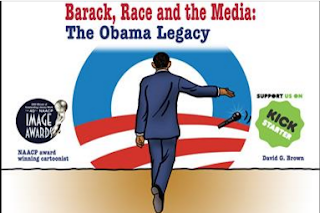 Inspired by the NAACP Image award winning Political cartoon book by David G. Brown Barack, Race and the Media: Drawing my Own Conclusions originally published in 2008. The book will feature the work of Los Angeles Sentinel newspaper cartoonist David G. Brown, Latino syndicated cartoonist Lalo Alcaraz, David Horsey, two-time Pulitzer Prize winning Los Angeles Times editorial cartoonist, Tim Jackson cartoonist and author of the book Pioneering Cartoonist of Color, Steve Greenberg and others.